Skil power tools bring to you more than 50 different tools for pocket conscious professionals and the Do-It-Yourself'ers. An international supplier of power tools, Skil are the proud inventors of circular saws bringing to you their line of Skil circular saws. This Skil saw is light in weight and packed with features that let you work all day without fatigue. The user has great controls over this saw, which make it extensively user friendly. The blade cuts through 2X material like a hot knife through butter. The motor is placed to the right which is quite a convenient feature for right hand workers. The demerits though are that it is hard to find replacement blades for it. The blade it comes with makes clean and accurate cuts, and the saw itself has more than enough power to cut through anything you might throw at it. 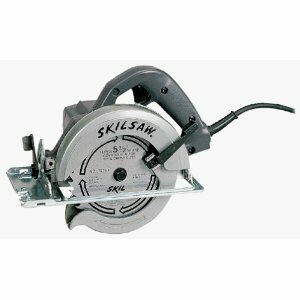 This skil Saw has also been tried and tested to make, beveled cuts in 2x4, and has ripped through without a problem. Users have also been very happy with the switch and the easy to use depth adjustment. This Skil Saw comes with a wrench that store in the guard, so you don't have to head back to the shed when you need to change the blade. In my opinion a helpful feature!! This saw purrs into action when started and delivers clean cuts through wood. Although a bit heavy, reviews have indicated that this Skil saw can be used overhead for several minutes without any inconvenience. Skil saws come with a steel foot which doesn't scratch or drag on lumber like aluminum does. Some downfalls experienced by users with this line of Skil saw are that for a saw this size, there are less selection of blades in stock and can not be found even in hardware stores. Furthermore, there is no adjustment stops for the 0 and 45 degree bevel. The foot on this Skil saw is out of alignment with the blade by almost 1/8", making it impossible to cut against a rip board. One of the most favorite features with this Circular saw is the laser, which make smooth even cuts. Do-It-yourself users have liked this particular feature that makes their job look like a pro. A downfall however is that users would prefer the saw to be a bit lighter. In my opinion, buying a good tool that would satisfy your requirements would depend on ones carpentry needs while not punching a hole through your pocket. Skil power tools do deliver skillfully made tools for those skillful working hands and a total satisfactory work experience. Return From Skil Circular Saws Page to Home - Finishcarpentryhelp.com.